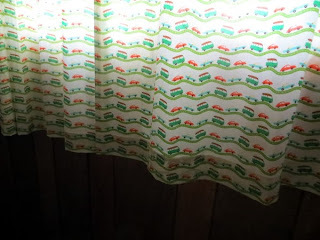 Yesterday's mail yielded a batch of fabric which was purchased by me in one of those moments when I pretend to be a person who sews instead of a person who aspires to sew. You know, someday when there's time. The fact that occasionally there is time is doing nothing to help restrain me from giving in to these bouts of optimistic shopping. See? I sewed something this summer. 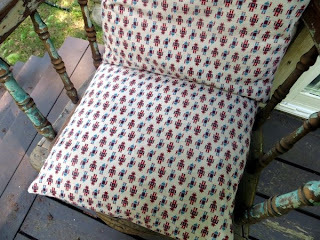 In June actually - new cushions for my Grampa's old chair, in a nice cheery print. Come to think of it, the whole 'time' thing is probably why knitting is a good choice for me: the tools are so portable, and there's usually time in the day somewhere. 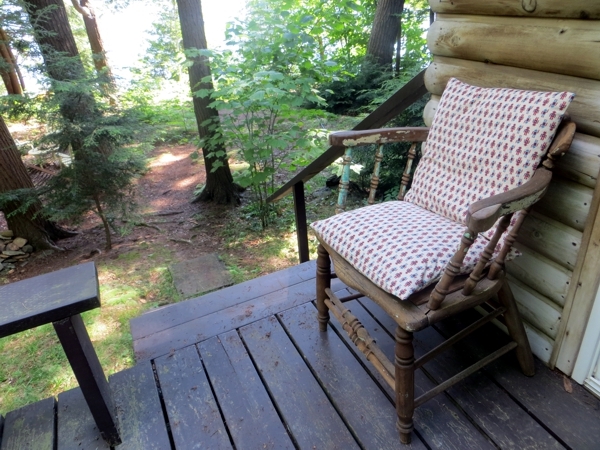 And more often than not, a place to sit to do it as well... like this chair, now that it's got cushions. I had a hard time finding cushions to cover, once I got looking. The diameter wasn't so hard to come by - 16" square - but the newfangled puffy pillows in all the stores today were just way too lofty for this compact piece of furniture. In the end I just recovered two very old pillows long since crushed flat and, frankly, pretty disreputable in their pre-slipcovered form. It's too bad given how crazy I get over sewing materials, especially ohhhhh, the fabric!, that the actual construction of things isn't second nature to me. Every bag I make consumes hours of brain-cudgeling as I try to work out the math and the order of seams. 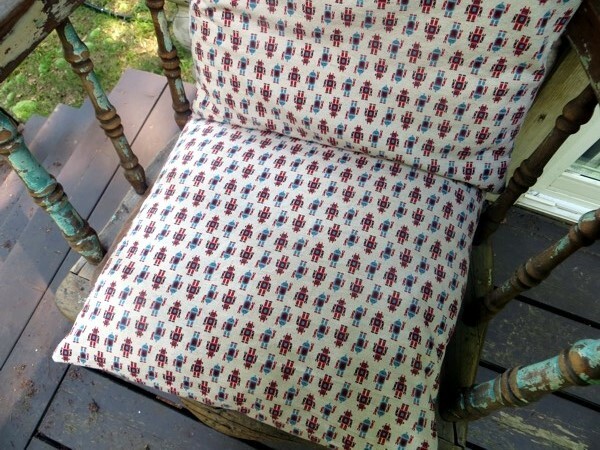 Cushions, on the other hand, are so easy that even I can do them. For the 16" cushions, I cut a 17.5" square piece, and two more pieces that were 17.5" by 12", both of which I then finished with a narrow double fold along one long edge. With wrong sides facing, and the shorter pieces lying on top of the bigger one and overlapped along their newly finished edge, I ran a .5" seam around the outside of the square, and then flipped the result inside out to iron flat and run another 1" seam around the outside of the square. Technically I don't need to do these French seams any more now that I have a zigzag function on my sewing machine, but I do love them. 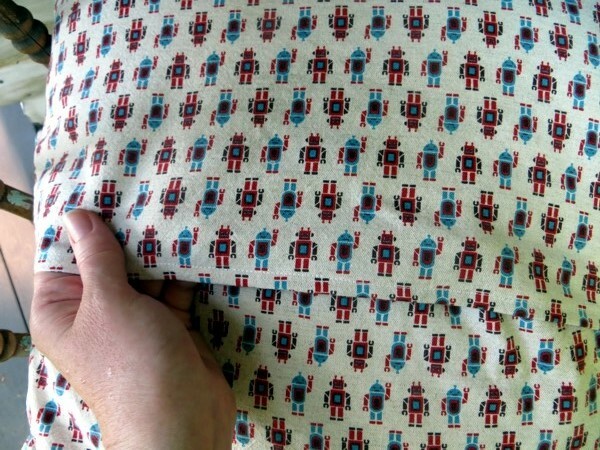 And there is nothing zippier than a fold-over closure like this for cramming an old pillow into a new cover. Hello, friendly blue and red robots. I wonder whether my Grampa would have minded having robot cushions on his chair? Best not to think about that - let's all go have a marvelous weekend instead. My plan: to sit in Grampa's (or some other already-prepped) chair, and knit. See you Monday! p.s., remember when I was having an awful time making myself fix that curtain panel that was an inch longer than its partner?